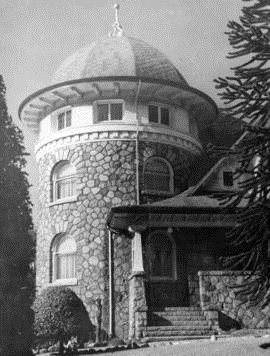 1025 Gilford Street – about 1927 – detail from postcard – West End Residential View – Vancouver BC Canada. 1025 Gilford Street was at the northwest corner of Gilford Street and Comox Street. Legal Description: District Lot 185, Block 69, Lots 32-33. 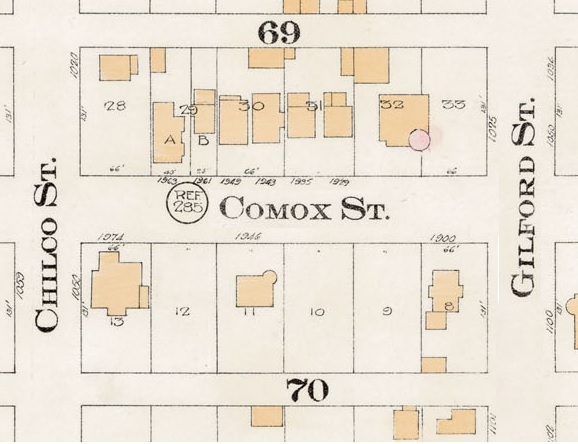 1900 Block Comox Street – Detail from Goad’s Atlas of the city of Vancouver – 1912 – Vol 1 – Plate 8 – Barclay Street to English Bay and Cardero Street to Stanley Park. 1025 Gilford Street; 1913, detail from Denman Street to Haro Street to Chilco Street to Comox Street; 1972-582.29 – Plate 54; Reference code: AM1594-MAP 383-: 1972-582.29; https://searcharchives.vancouver.ca/plate-54-denman-street-to-haro-street-to-chilco-street-to-comox-street. Thomas Arthur Fee (1863-1929) designed and built this house. Vancouver Province, November 29, 1906, page 1, column 4. 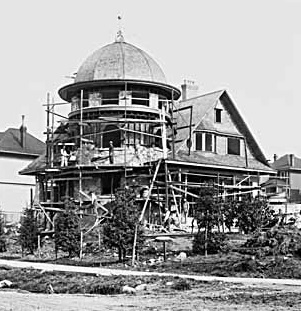 1025 Gilford Street under construction, detail from House being built at Gilford and Comox about 1903 [sic]; Vancouver Public Library, VPL Accession Number 1878. 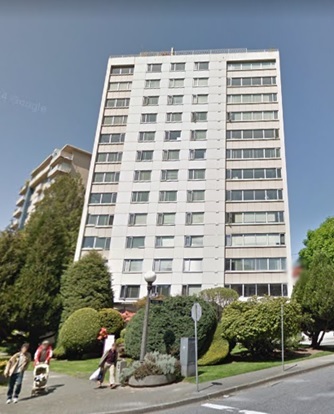 There are no references to this property in Heritage Vancouver Society’s database of historic building permits: http://permits.heritagevancouver.org/index.php?cID=1 [searched February 20, 2019]. 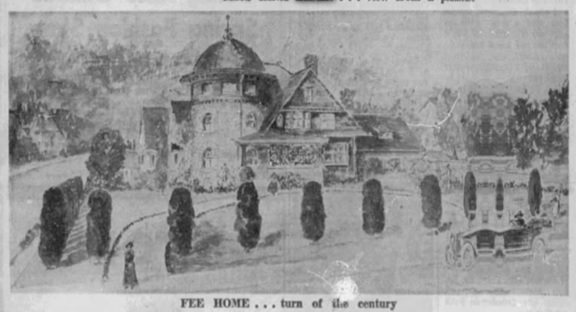 Thomas Fee and members of his family lived in the house from about 1907 to 1935. 1025 Gilford Street – detail from Vancouver Public Library – Home at 1025 Gilford – VPL Accession Number – 16134 – after 1910. Entrance to the residence of Thomas A. Fee; 1029 [sic] Gilford Street, 1957; Vancouver City Archives; AM54-S4-: Bu P729. A series of holly trees lined the perimeter of the property. 1025 Gilford Street; detail from First Beach, 1954; BO-54-211; http://vintageairphotos.com/bo-54-211/. 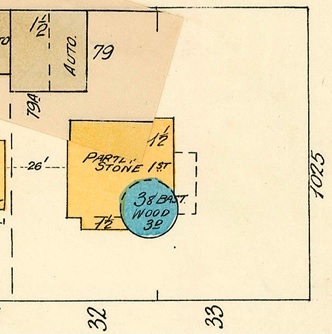 1025 Gilford Street, 1957; detail from [Aerial view of the West End showing the increase of apartment buildings west of Cardero Street]; Vancouver City Archives, Dist P133, https://searcharchives.vancouver.ca/aerial-view-of-west-end-showing-increase-of-apertment-buildings-west-of-cadero-street. In the late 1930s and early 1940s, the family of Edwin Jordan-Knox lived in the house. 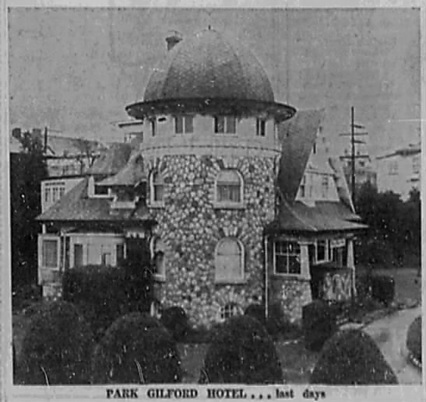 About 1946, the house became the “Park Gilford Hotel” (sometimes called the “Park Hotel”). British Columbia and Yukon Directory, 1946, page 1408 (Gilford Street). British Columbia and Yukon Directory, 1946, page 1059. Vancouver Province, September 11, 1952, page 33, column 4. Vancouver Sun, June 11, 1955, page 40, column 4. 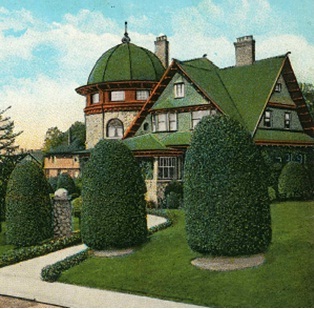 In February 1962, Rina Biden was the owner of the property. She was preparing to demolish the hotel, so that a new building could go up in its place. 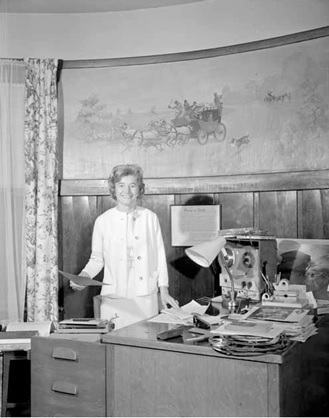 Miss Rina Biden in study, February 20, 1961, Vancouver Public Library, VPL Accession Number 42302; https://www3.vpl.ca/spePhotos/LeonardFrankCollection/02DisplayJPGs/508/42302.jpg. “Memories Are Made of This: One More Link with Yesteryear to Disappear,” Vancouver Province, February 25, 1961, page 27, columns 1-3. In March 1961, house-wreckers demolished the house. The furniture, the house contents and the building components were for sale. Vancouver Sun, March 11, 1961, page 36, column 2. Vancouver Province, March 25, 1961, page 30, column 8. Douglas Simpson designed a new building for the site, and construction was underway in 1961 and 1962. 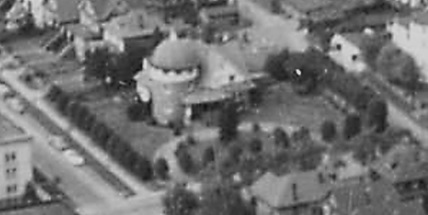 1025 Gilford Street; 1962; detail from West End from the air, Vancouver City Archives; Air P96; https://searcharchives.vancouver.ca/west-end-from-air. 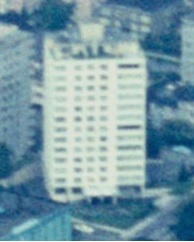 By March 1962, the new apartment building was on the site. 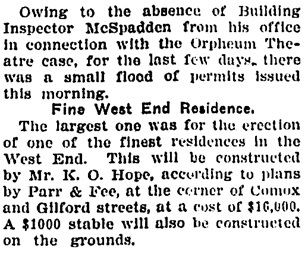 Like the former house, the new building was called “Park Gilford” and it had an address of 1025 Gilford Street. Vancouver Province, February 23, 1962, page 27, column 8. 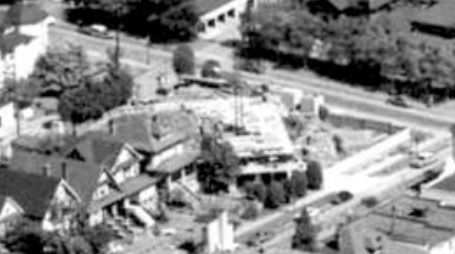 1025 Gilford Street; August 26, 1963; detail from West End and Apartment Houses; Aerial view from helicopter; Vancouver City Archives; CVA 160-14; https://searcharchives.vancouver.ca/aerial-view-from-helicopter-west-end-and-apartment-houses. 1025 Gilford Street; Google Streets; searched February 20, 2019; image dated May 2012. 1025 Gilford Street; Google Streets; February 20, 2019; image dated August 2018 [Comox Street side of property]. Parr and Fee, Building Vancouver; oosted on 27 November, 2011; https://buildingvancouver.wordpress.com/tag/parr-fee/. 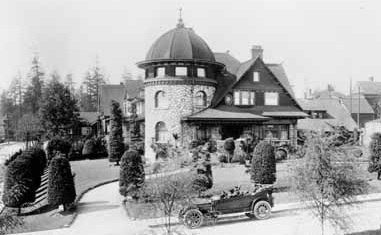 Park Gilford, 1025 Gilford Street; https://www.emporis.com/buildings/113050/park-gilford-vancouver-canada. Park Gilford, 1025 Gilford Street; http://skyscraperpage.com/cities/?buildingID=54313. 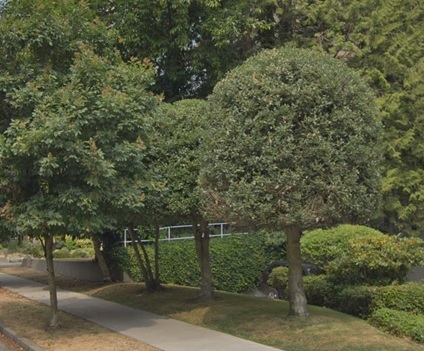 “The apartment block in question is the Park Gilford, a 14-storey building designed by Douglas Simpson, architect of the 1957 Vancouver public library.